Dozens Killed, Hundreds Wounded In Iraq; Attacks Blamed On Al-Qaida : The Two-Way A wave of attacks, seemingly coordinated, struck security forces in predominantly Shiite areas. The attackers fired weapons and exploded bombs. 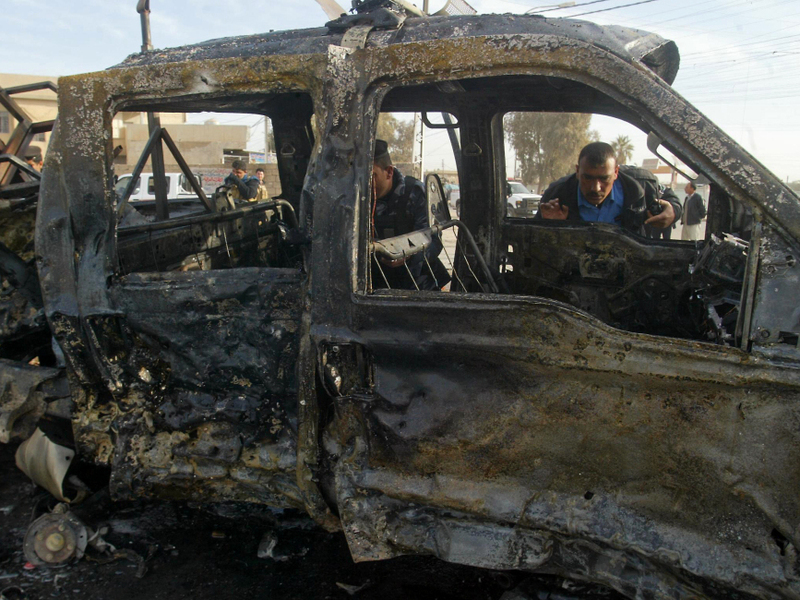 An Iraqi policeman inspects a destroyed vehicle at the site of a blast in the northern city of Kirkuk earlier today (Feb. 23, 2012). "A rapid series of attacks spread over a wide swath of Iraqi territory killed at least 50 people on Thursday, targeting mostly security forces in what appeared to be another strike by al-Qaida militants bent on destabilizing the country," The Associated Press reports. Various media reports indicate that more than 200 people were injured. Al Jazeera correspondent Jane Arraf, "reporting from the Iraqi capital on Thursday, said the attacks included car bombs, roadside bombs seemingly targeting police, and gunmen opening fire on police patrols. 'The blasts seemed to happen at almost the same time, in what are being seen as co-ordinated attacks,' she said." According to the BBC, "the violence targeted predominantly Shia areas, in particular police officers and checkpoints." There were attacks in the cities of Baghdad, Mosul, Kirkuk and and in the province of Salahuddin, the network says. The Guardian adds that "in the worst attack, a car bomb went off near a security checkpoint in the Baghdad's Karradah shopping district, killing nine people and wounding 26, including four policemen, officials said." "There have been a series of large-scale attacks by insurgents since the last U.S. troops left Iraq in mid-December at the end of a nearly 10-year war. Shortly after the withdrawal, a major political crisis with sectarian undertones erupted as well when Shiite-dominated authorities sought to arrest Sunni Vice President Tariq al-Hashemi on allegations he commandeered death squads targeting security forces and government officials. "While no group immediately claimed responsibility for the latest attacks, targeting security officials is a hallmark of al-Qaida in Iraq. In December, a wave of bombs tore through mostly Shiite neighborhoods of Baghdad, killing 69 people in a similar onslaught of violence that Sunni-dominated al-Qaida claimed."